With the coldest months still to come in Barcelona there could still be some snow. But with balmy temperatures worldwide this year thanks to a particularly strong El Niño it’s looking highly unlikely. 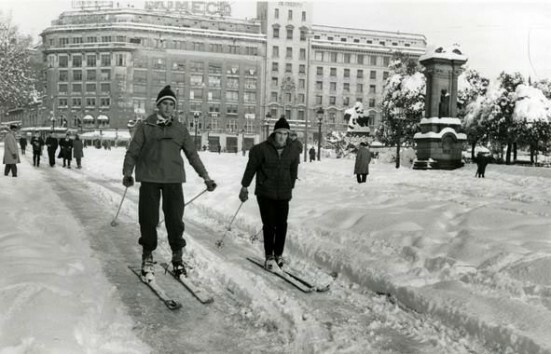 So for fans of winter whiteness check out the famous snow in Barcelona during the Christmas of 1962. This was one of a handful of years on record where snow fell in the city but was by far the heaviest of the 20th century, most people had never seen or experienced anything like it. Luckily this freak occurrence is well documented online with photos and videos. Below are a few of the best videos to give you an idea of what the city and surrounding area was like. Will this ever be seen again in the city? I hope so. Maybe this particularly strong El Niño will lead to a similarly strong cold-weather La Niña. A great collection of black and white stills from Barcelona put to a bit of Enya. A well-produced narrative video about the snow in Viladecans from the Ajuntament de Viladecans channel. Arenys de Mar Under the Snow – includes a nice shot of the beach covered in thick snow. And to end, a video from the Badalona Memories channel. With a quite excellent Spanish rendition of White Christmas.